CAT control AND linear switching with one clever cable! One problem with the FT-8x7 series of transceivers is that the CAT interface and the PTT output share the same connector. 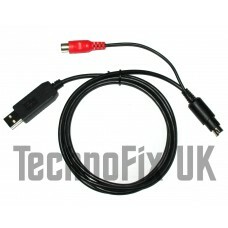 This unique cable not only allows you to control your radio from your PC, but also provides a linear amplifier PTT switching output too! For example, you can use remote control software like Ham Radio Deluxe or edit and backup your memory channels easily with FTBasicMMO. Contest and logging software can fetch your operating frequency and mode direct from the radio. If you are working satellites, your computer can automatically track your transmit and receive frequencies and compensate for doppler shift. The other end has a USB plug which connects to the PC's USB port. The cable contains a USB to serial converter, so the radio appears as a COM (serial) port on the PC. This cable also enables your Yaesu radio to control the transmit/receive switching of your linear amplifier. Essential if your linear doesn't have RF sensed switching. Even with amplifiers with RF switching, it eliminates the need for switching delays that often mean missing the first part of the other station's transmission - irritating at best, but disastrous while contesting or working fast CW! The transceiver end of the cable has a short pigtail with a phono (RCA) socket. You will need a screened (shielded) phono (RCA) cable to connect to the Key, Tx or PTT input connector of your linear amplifier. This cable is not included as individual requirements vary. Suitable cables are available in our shop.